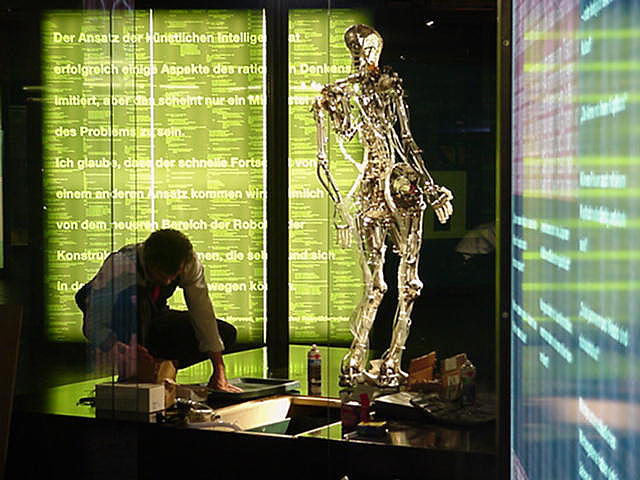 Skeletal Reflections is an autonomous, humanoid robot that engages its audience by enacting art historical interpretations of the viewer’s physical stance. In exhibition, human participation determines the machine’s responsive postures. The viewers’ bodily gestures are digitized and analyzed with motion capture technology. These poses are then used to summon similar classical poses from art history that Skeletal Reflections subsequently displays. The skeletal model is capable of not only holding different positions, but also of communicating a survey of historically significant poses. Skeletal Reflections acts as a symbolic representation of the similarities between man and machine, sculpture and technology. The extraordinary contrast between classical art historical poses, and the responsive, pneumatically-driven machine that displays them, reveals the possibilities for an engaging dialectic between art and robotic technology in the act of portraiture. Skeletal Reflections’ original title was The Emerging Skeletal Self. The intent of the exhibit was to provide the viewer with an impression of the importance of body language. Humans’ reactions to each others’ body language has been a key in communication from the rise of mankind to the present. The Emerging Skeletal Self was intended to take on the challenge of a multiply dexterous humanoid with rich communicative abilities. 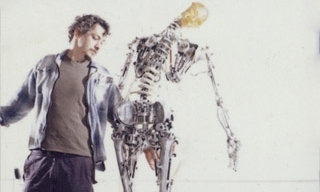 The piece was originally conceived as part of a larger environment, expressing through its animated skeletal body both the concepts of life and death in a single form. The skeleton was to be one of four such creatures, responding to its audience via sequences suggesting the capacity for communication. The connections made by the skeletons in The Emerging Skeletal Self would remind us of our humanity, our mortality, and even our sense of humor. The integration of the art historical perspective that defines the Skeletal Reflections phase of the project was inspired by the parallel between the communicative function of body language and the dynamics of human bodily gestures used to tell stories in artistic depiction. The studied, organized approach art history takes to the use of the human body in composition provided a fertile and varied point of departure. Further, this history is familiar and evocative to many. The performance of these historic artistic moments in a communicative context introduces the ideas of memory, beauty, and composition to the face-to-face encounter with Skeletal Reflections. Skeletal Reflections was conceived, machined, assembled and programmed by Chico MacMurtrie and the crew and interns of Amorphic Robot Works.